How does the idea of captive versus captivated translate into classrooms? As teachers, we often do not have control over what we must teach. But, we do have some control over how students engage in learning. This story has an unusual opening. 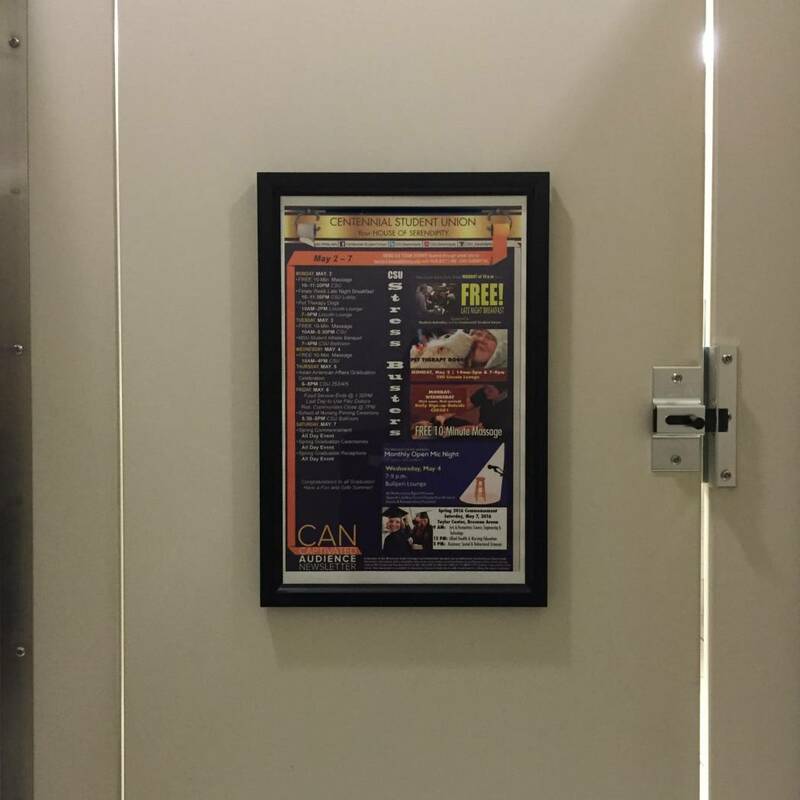 Upon shutting the bathroom stall door at a college campus I was recently visiting, I was greeted by a framed poster of information and upcoming university events called the Captivated Audience Notice (CAN). I’ve seen this method of communication before, titled the Toilet Tribune, the Potty Press, and other clever monikers. But, this particular version irritated me. Captivate, as defined by the Cambridge Dictionary, means to hold the attention of someone by being extremely interesting, exciting, charming, or attractive. Allow me to assure you, none of the information presented on that poster was more than mildly interesting, and it was certainly neither exciting, charming, nor attractive — mainly because it was all irrelevant to me. In my opinion, a better title for this series of posters would be the “Captive Audience Notice”. While I was not truly a prisoner in the stall, I definitely did not have a choice in whether to use the bathroom, and no real option to escape once I entered the stall. The only choice I had was whether to focus my attention on the poster. My willingness to read the poster stemmed more from the novelty of its placement in the bathroom stall, a location where there was nothing else to capture my attention for the few moments I spent there attending to other matters, than because I was curious about its content. I have absolutely no recollection of what was printed there. It merely served as something to occupy my mind in a situation where I was momentarily held captive by my body’s needs. This got me thinking. How does the idea of captive versus captivated translate into classrooms? Are our students treated as prisoners prohibited from escaping under the guise of teaching them? Or, are we cultivating experiences that are extremely interesting, exciting, charming, or attractive to hold their attention to facilitate their learning? How often do students attend to something that is irrelevant or uninteresting, simply because they have no choice but to be in the classroom and once there, nothing else for them to do? How often are students’ curiosities piqued by something at school that is so exciting, they can’t help but pay attention? Are they being held captive by teaching or are they being captivated by learning? To me, this seems far more representative of the actual, underlying issue here. And, it certainly paints students in a better light, though not so much the teachers who would prefer to blame them for their lack of attention, motivation, and engagement in assignments that are neither personally relevant nor representative of what is expected of them as modern citizens in our society. Why do we resort to using points as bribes for compliance? Why do we blame students for not engaging with what we attempt to force them to learn when lessons are designed to fit standards rather than facilitate student growth toward personal learning goals based on individual interests and aptitudes? As a part of my job, I am required to attend specific professional development opportunities. These are workshops or programs others have chosen for me based on what they believe to be important learning for a person in my role. Some of them are indeed relevant and interesting to me both personally and professionally; many (if not most) are not. 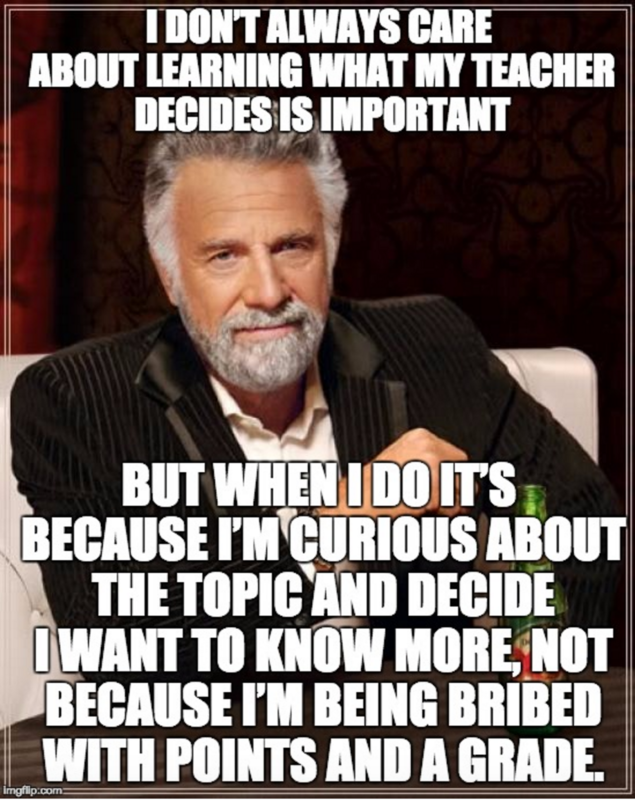 Luckily, I also have a few opportunities (though, not many) to select my own options for professional development based on my interests, aptitudes, abilities, and self-assessed needs for growth within my role. Can you guess which opportunities directly impact my personal growth and professional practice because I engage in and learn from them? Can you guess which opportunities I spend disengaged, either talking with those around me or focused on my laptop, working on activities that are more personally and professionally relevant to me? Can you guess which opportunities I am excited to attend and those I dread? I theorize that students who are held captive by teacher-driven, teacher-centered, unengaging, uninteresting, and irrelevant content deal with their forced captivity in one of three ways: misbehavior, compliance, or a mix of both. Students who misbehave are disruptive. They talk to each other. They bother other kids. They get up to go to the bathroom when they do not need to go. They sharpen their pencils until all that is left is a tiny, sharp point and an eraser (and then they sharpen the eraser). They doodle. They text their friends. They sing. They tap their pencils as if playing a drum solo in a heavy metal band. They hold a pencil between their thumb and forefinger and wave it up and down so it appears to bend. They make funny noises. They stare out the window. They think about what they plan to do when class is over. They interrupt the teacher. They daydream. They watch the clock. They post on social media. They ask questions that were already addressed. They frustrate the teacher. I, myself, am guilty of many of these behaviors when faced with being forced to “learn” content someone else has selected for me. How about you? Conversely, compliant students follow the rules. They stay in their assigned seats. They remain silent during work time. They use their time wisely. They make pretty posters. They diligently take notes. They follow all directions. They listen the first time. They memorize. They copy from the board. They develop flashy slide shows. They repeat facts. They do what they are told. My hunch is that the these compliant students are mostly comprised of rule-followers who do what they are told because it is how they were taught to “play school.” They may be motivated by praise, points, and grades, but they are not engaged in learning. They likely get very little out of what is being taught; thus, although their behavior may be preferable because it is easier for teachers to manage, their learning is no better than that of their misbehaving peers. While it may seem like the ideal classroom situation to have rows of dutiful students, silently listening, scribbling down notes, following directions, memorizing information, and repeating facts, in reality, these students are held captive by teaching. The students who comply do so because there is nothing else to attend to. In my experience, when people are captivated by what they are learning, they behave appropriately (and by this I mean fittingly, according to the learning situation) simply because they are interested in a topic that is of personal relevance. They are excited and motivated to learn more. They identify what is important enough to learn and what is not. They decide the best way to do the learning. They determine their own modes through which to make their learning visible to others. They determine whether to make their learning visible to others. They explore new avenues of learning just to learn more. They seek out new resources. If a prerequisite skill exists that must be attained in order to facilitate their learning, they will master that, too. And, they stop learning about something that is no longer of interest to them and move on to the next topic. Being truly captivated by learning is hard work! No matter the topic, it requires creativity, reflection, determination, problem solving, collaboration, critical thinking, self-assessment, perseverance, and the transfer and translation of knowledge into new situations. These are the kinds of skills our students deserve to have as they leave our school systems. These are the kinds of skills their potential employers will be requiring. These are the kinds of skills people need to succeed, no matter the path they choose. And, as educators, it is our job to provide them with opportunities to develop these skills. How do we really want to educate? Do we want compliant students who either do what they are told or misbehave because they are held captive by teacher-driven, teacher-focused instruction? Or, are we willing to facilitate students’ captivation in their own learning? If we want our students to leave school with the requisite skills necessary for success along any path they choose, we must provide them with opportunities to think for themselves and make decisions about what is important to learn and when and how to do the learning. Only then will students truly be captivated by their learning and not held captive by our teaching. Can we come together as a community to transform learning?